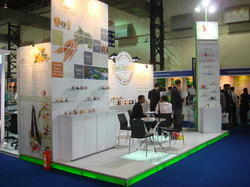 Inoways offers completely modular exhibition stand designing supported supply of the modular displays. We also offer installation services for these modular exhibition stalls. Owing to our extensive domain expertise, we offer to our esteemed clients a wide range of reliable Modular Stand We incorporate these systems with the modern technologies and advanced features that make them a preferred choice among the clients. Besides, developed in strict compliance with the international quality standards, the services are known for their quality, effectiveness, reliability, personalized approach and timely execution. Magentic popup system is a portable backdrop shelter that can be set up within minutes of arriving on site with no special tools. The structure is supported by composite struts. Inoways has been manufacturing magnetic pop-up systems for almost 15 years now with over 500 satisfied customers across the country. Since our magnetic pop-up systems are manufactured in India, we are in position to support you with all spare parts and manpower to repair/service the structure. Looking for Modular Exhibition Displays ?